In what will be a two pronged display of their growing naval powers, India will deploy its two fleets, Eastern and Western, to the northwest Pacific Ocean and West Asia respectively. For India, these missions are more than just going port to port and displaying their flag, rather it is about engaging in naval diplomacy and showing off the naval muscle of the country. — Neeraj Rajput (@neeraj_rajput) 18 мая 2016 г. 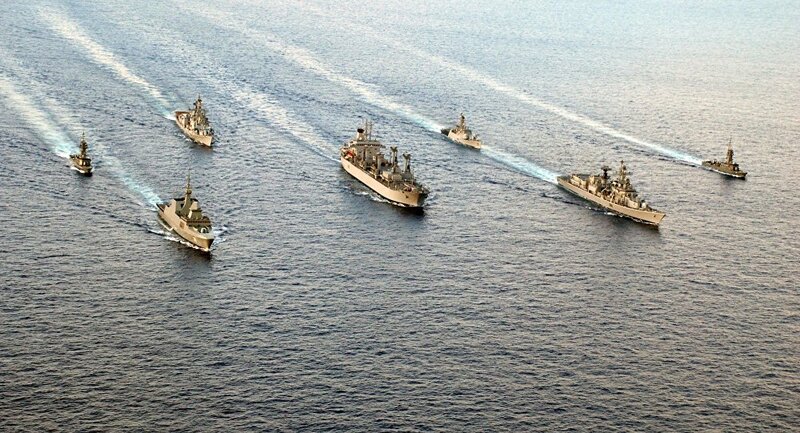 The Eastern Fleet will take part in Exercise Malabar, an annual joint naval event, alongside the United States and the Japanese Maratime Self Defense Forces. The Fleet is comprised of two stealth frigates, INS Satpura and Shahyadri, the Shakti fleet replenishment ship and the Kirch guided missile corvette. The goal of the Exercise is “interoperability,” however, many have commented that it is rather just a way for the US to increase its influence in the region. Most particulary, it is China that India, the United States, and Japan fear will gain power in the South China Sea. During its cruise, the fleet will travel Cam Ranh Bay (Vietnam), Subic Bay (the Philippines), Sasebo (Japan), Busan (South Korea), Vladivostok (Russia) and Port Klang (Malaysia) according to an Indian navy spokesman. The Western Fleet, on the other hand, will be taking part in a smaller exercise in tandem with the Royal Bahraini Naval Force in Manama. It is comprised of the INS Delhi, the comparatively new Tarkash destroyer, a frigate and a Deepak fleet replenishment ship.